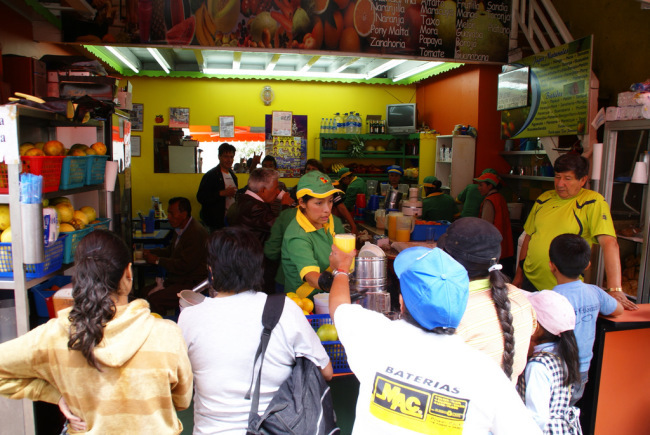 Our plan was to take you on an extensive culinary tour through the city of Quito, the capital of Ecuador, located in the middle of world. There were so many places and so many different foods we wanted to try and share with you, but how we could possibly do this in just 24 hours? So, we split up into two teams: on Team #1 we have two students in love: Matt (my French brother-in-law) and Olga (his beautiful Ecuadorian girlfriend); and on Team #2, we have yours truly and Marc (my 3 yr old). 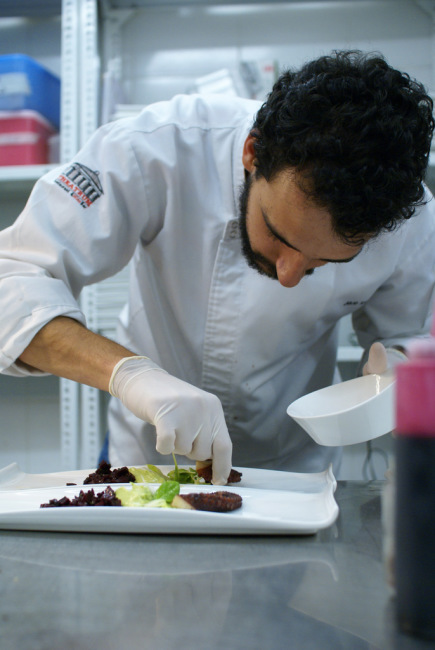 Team 1 is going to show you the more romantic side of the city, while Team 2 is going to show you that even a 3 year old can enjoy a gastronomical adventure in one of the oldest cities of South America. This is a long story to tell in one post, so we will split this story into two parts. The first part is Matt and Olga’s adventure. Enjoy! 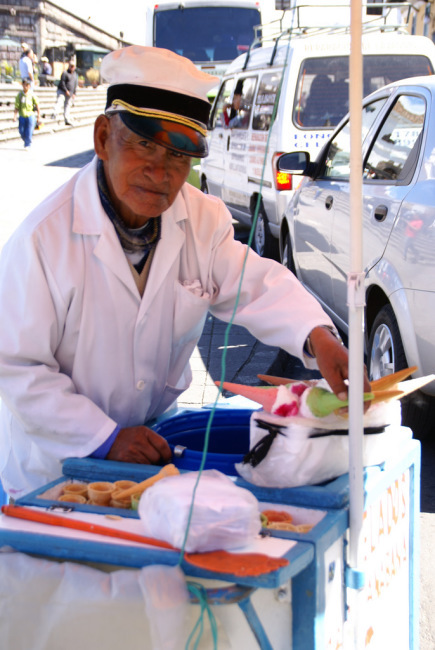 Quito is an exciting mix of both old and new: colonial buildings huddled next to local skyscrapers and US style shopping malls, on the busy streets business professionals stride pass indigenous musicians, fruit and craft sellers. 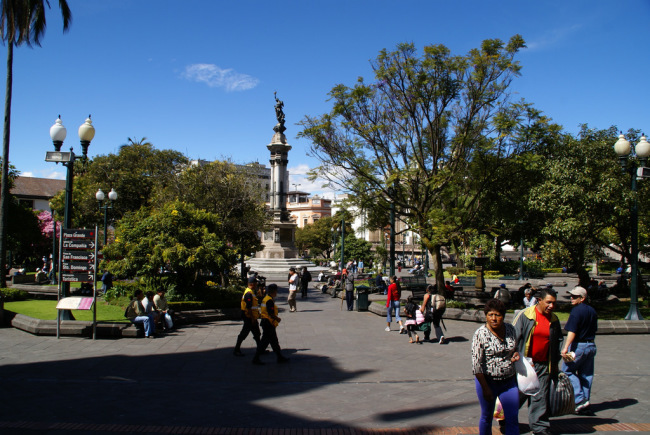 Quito, 2850 meters high (that’s 8,464 feet above sea level), has perfect spring weather thanks to its location in the heart of the Andes. You know you’re in the Andes wherever you walk because you are constantly out of breath (this is not true for the locals who are accustomed to the altitude). 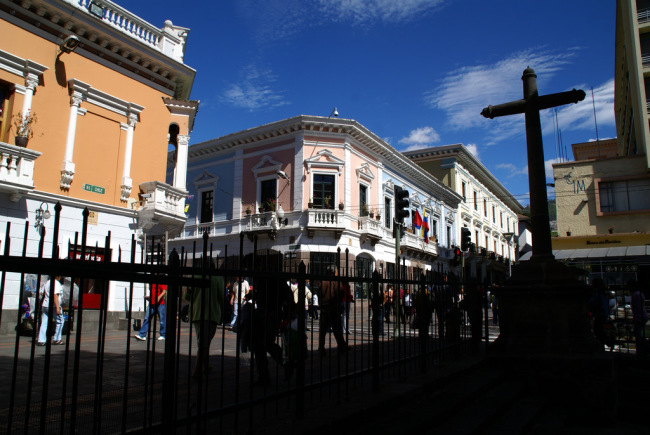 The city is surrounded by marvelous volcanoes, including the Pichincha to the West as well as the Antisana and the Cotopaxi – the highest active volcano in the world. 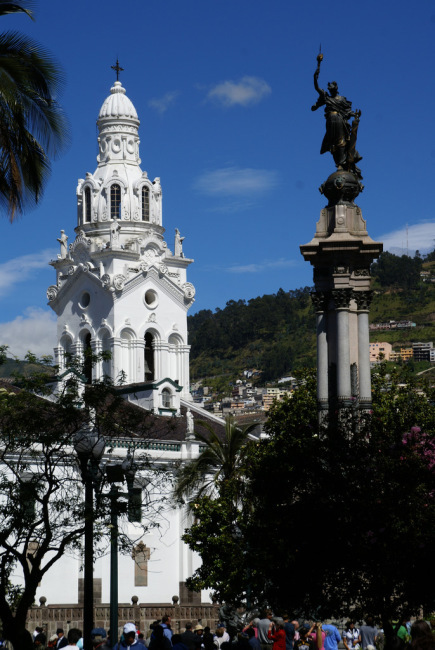 Quito not only offers a spectacular natural setting, but it has also an exceptional historical and architectural wealth. 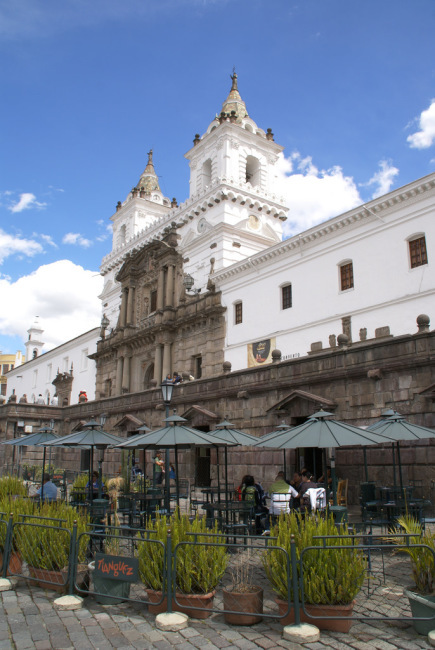 Indeed, it was the capital of a much bigger area called “The Kingdom of Quito”, this explains the high concentration of colonial churches and museums. In 1978 the city was first in the world to receive World Heritage Site status from UNESCO. We’re pretty sure you’re not aware yet of how cool this city is, but we hope we’ll convince you with this brief panorama of the quiteño’s daily life. Indeed, our main goal is to show the world all the quality food, culture and “stuff” our little cozy country has to offer. We could spend hours promoting this incredible spot on Earth but this is not the aim of the story. However, we strongly recommend this great place called Ecuador because of its rich diversity: mountains, beaches, the Galapagos and the Amazon jungle. 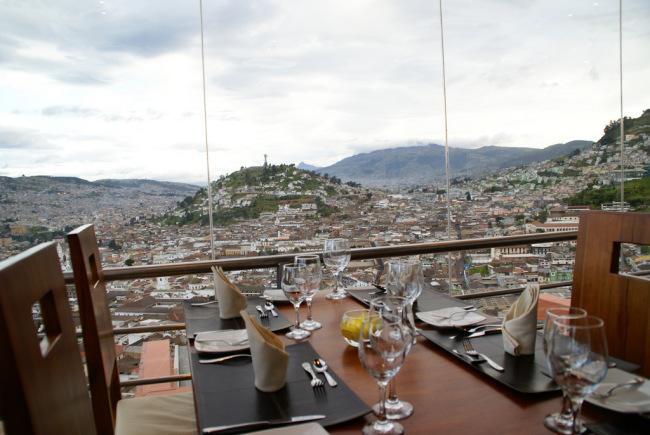 We decided to give you a glimpse of both Quito old town (Center) and new town (North); the goal of this day was food, food and food, in fact we had the feeling we did not stop eating. We started our day in the Centro Historico or Colonial Center of the Quito, one of the most impressive things in this city is that you can find food everywhere: walking in the streets, at traffic light stops, and so on; the same is also true for local street artists and lottery ticket vendors. 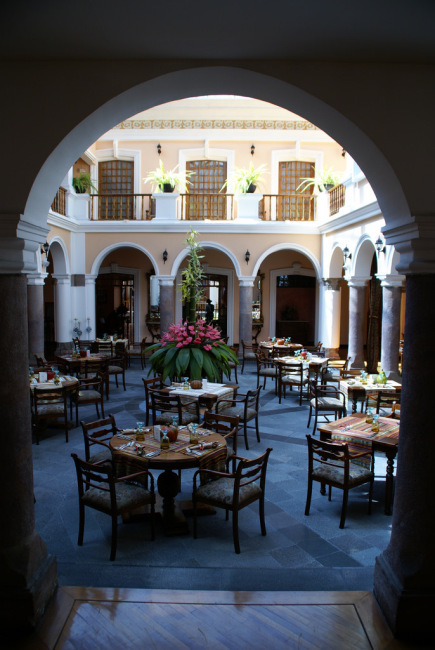 Olga and I spent a month in Quito in 2006 and one of the restaurants we went to back then was Tianguez, located under the San Francisco atrium on the Plaza by the same name. We came back because of the incredible location and the good vibes of the place. 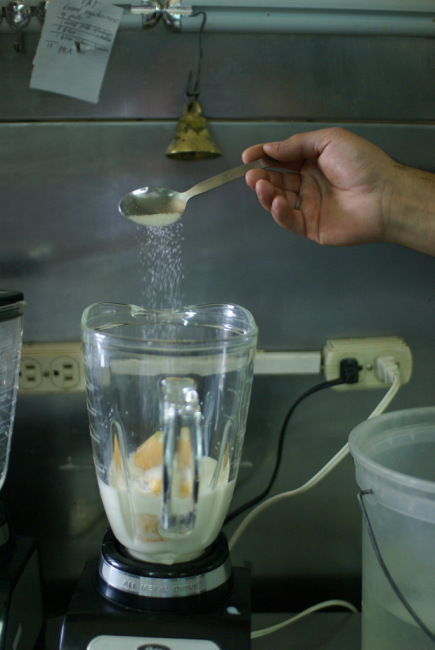 Our waiter John welcomed us warmly and the chef allowed us into his kitchen to take photos while he prepared a fruity milk shake. 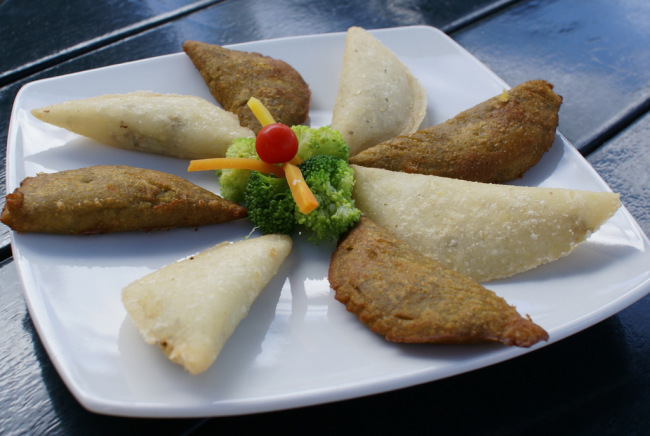 For breakfast Olga had a tasty humita – a fresh corn cake stuffed with cheese and steamed in the corn husk, and the tree tomato milkshake. 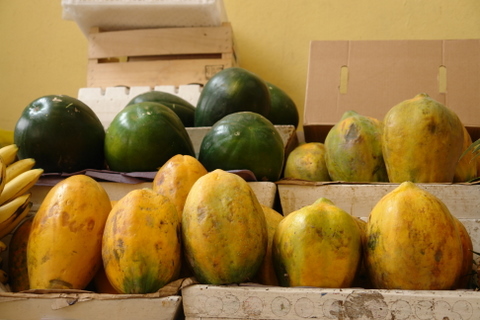 Tree tomatoes, also known as tamarillos, are a typical fruit from Ecuador; they are used frequently to make fresh fruit juices, as well as to make the traditional aji de tomate de arbol or spicy tree tomato salsa. My breakfast consisted of a plateful of empanadas de verde or green plantain empanadas as well as empanadas de morocho or corn empanadas; I also choose to start the day with a canelazo or naranjillazo, a hot drink made with local aguardiente (cane sugar alcohol), cinnamon, and naranjilla – another delicious local fruit. 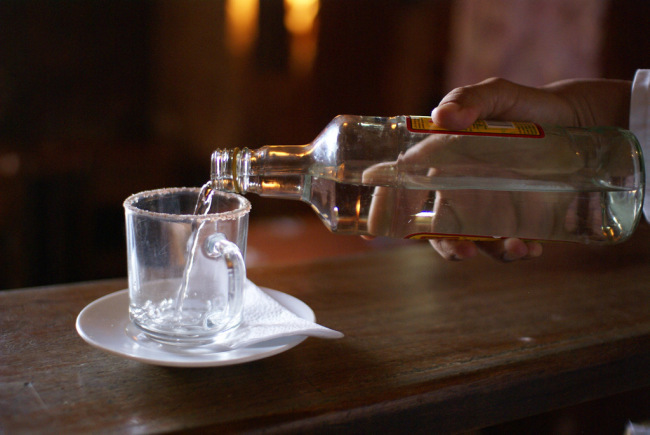 I took a canelazo because Layla suggested it as one of the things to try on this culinary tour, but in the end, it appears that it was not a good choice for a breakfast drink, since it contained something such a large amount of aguardiente. According to Olga canelazo is best drunk at night (especially cold ones) in order to warm up or sleep easier, she does not recommend it for breakfast! After breakfast we spent a couple of hours walking in the colonial streets to the see the old town sights with the sun warming us up , along the way we had some freshly made orange juice at a juice stand. 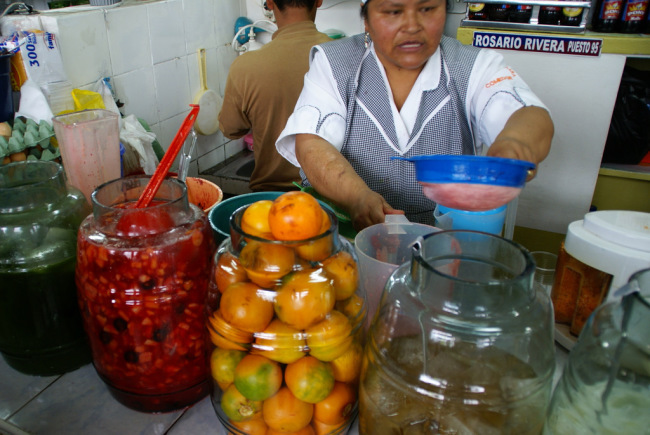 Fresh juices are one of the best things that Quito (and Ecuador) has to offer, they are inexpensive and delicious. 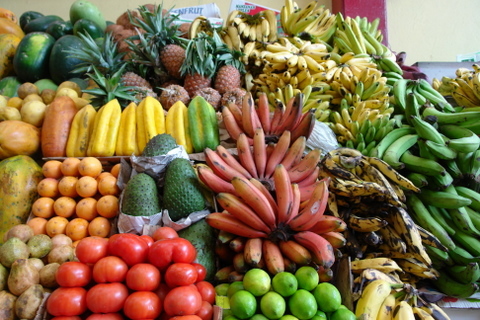 You can find them made with every type of fruit imaginable, this is due to both the climate and the fertility of soil that allow such a huge selection of fruits to be grown in Ecuador. For lunch we wanted to stay on the traditional route so we headed to the Santa Clara market, a food market located close to the State University. 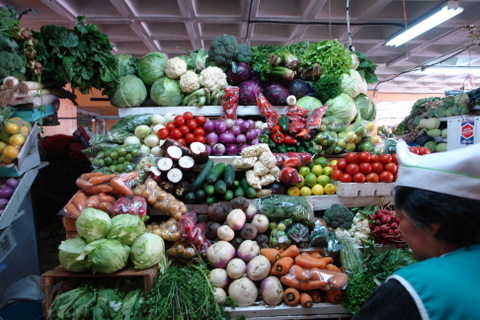 On the bottom floor of the market you can find an amazing variety of fruits, vegetables, and herbs, as well as a food court with various food stalls that serve typical food. 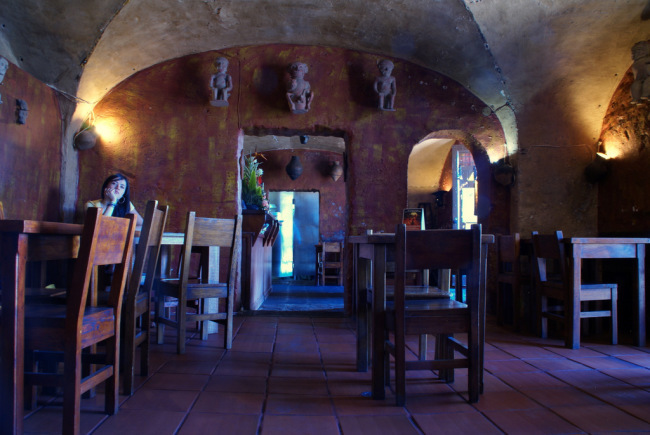 On the second floor you will find meat and seafood, and also local ceramics and woven baskets. 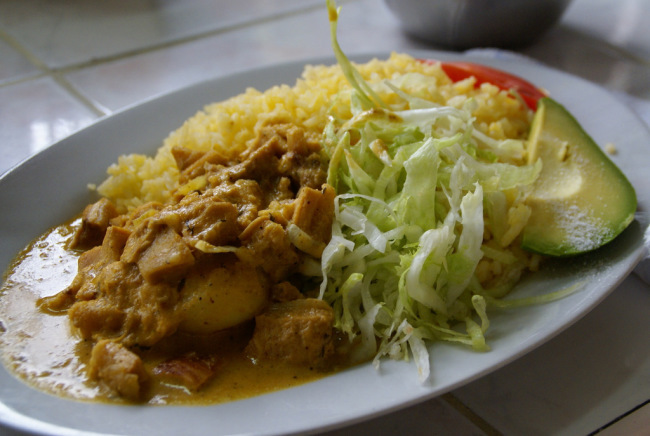 We thought this would be a very authentic place to have lunch, as most of the people having lunch there were indeed locals.Olga tried the come y bebe – a drinkable fruit salad, and guatita –cow stomach or tripe with potatoes in a creamy peanut sauce. 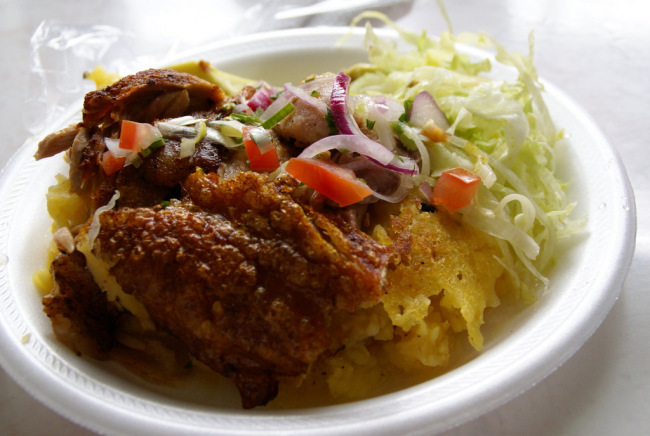 This dish (as well as many other Ecuadorian dishes) is also known as wonderful cures for chuchaqui – a hangover. 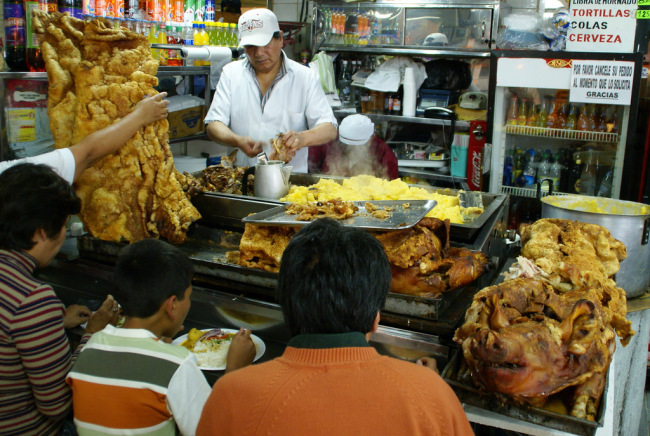 I had a juice made with moras or local blackberries and hornado – a very good roasted pork dish where the pork is marinated for several days with garlic, spices and beer, and then slowly roasted until the meat is tender and just melts in your mouth. 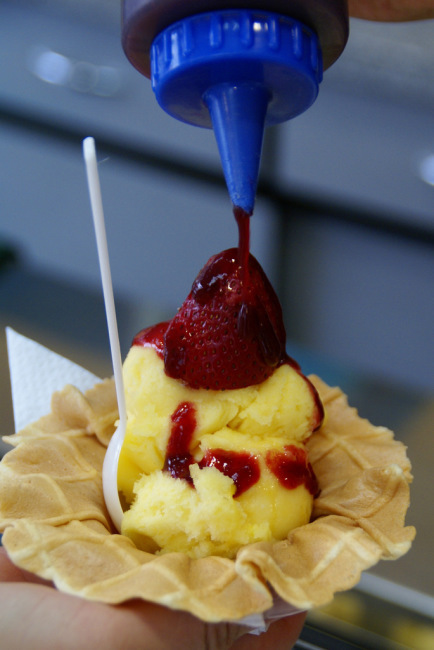 To finish our lunch, we decided to go try the some helados de paila – handmade fruit sorbets, we heard great things about the ones made by Rosalia Suarez, but after searching and not finding her place, we gave up and went to Lekka Lekka, which was a close-by great alternative (if you find los Helados de Paila de Rosalia Suarez, please give us the address!). 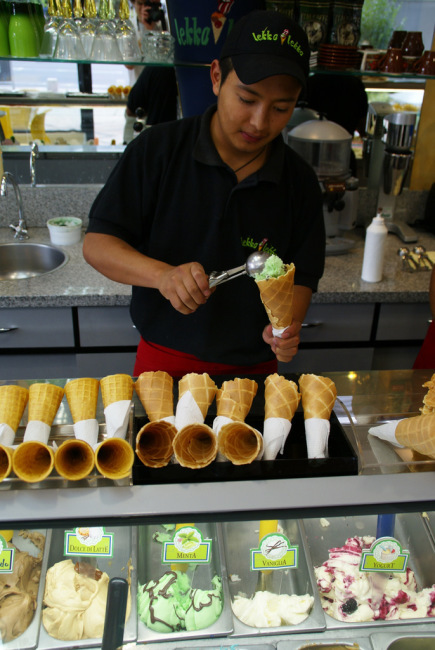 Lekka Lekka makes great Italian style ice cream and is located at Los Shirys and Republica del Salvador. 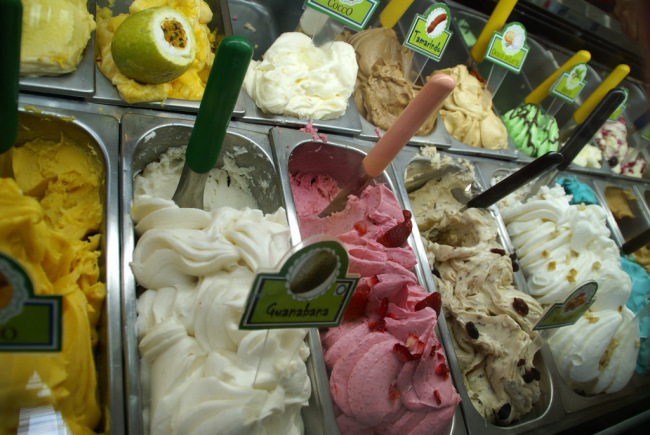 Olga tested 90% of the flavors before choosing a maracuya or passion fruit one, while I went for a mint/cappuccino ice cream. 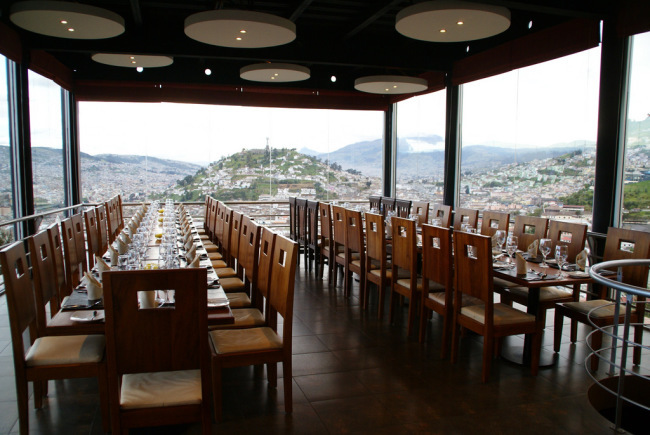 El Ventanal is a new trendy restaurant with a great view of Quito. Olga and I discovered it recently thanks to a recommendation by Monse (my Ecuadorian mom and friend). 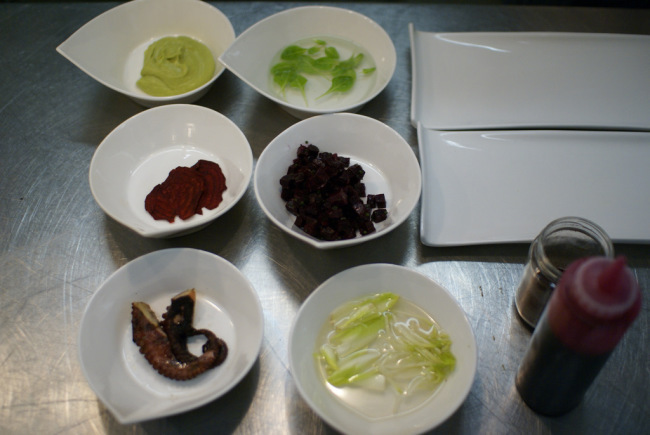 On our previous visit we had a charming night: the service was perfect, the food was modern and tasty, and the wine we had “a la copa” made the night joyful. We wanted to come back for Foodbuzz 24-24-24, to see the sunset from there. Unfortunately, the restaurant was completely reserved for a presidential event. We called Katrin, the German manager of the place, she helped us and let us come anyway to take some pictures and enjoy some wine before the presidential security arrived. She was very sweet and we appreciate her effort. 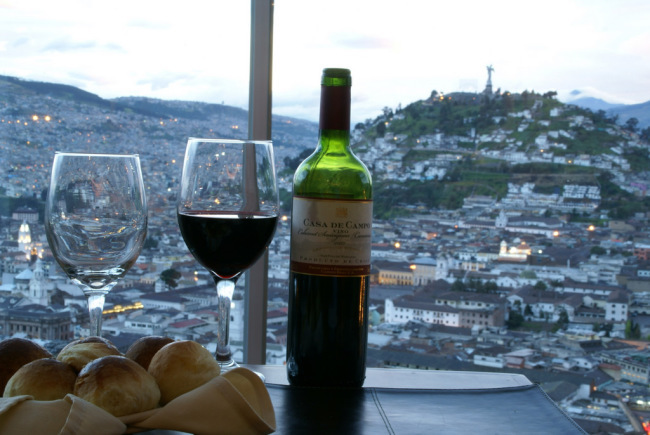 We could not order anything else besides bread and butter to go with our Chilean wine, but the view was amazing and we are happy to share it with you. Enjoy! 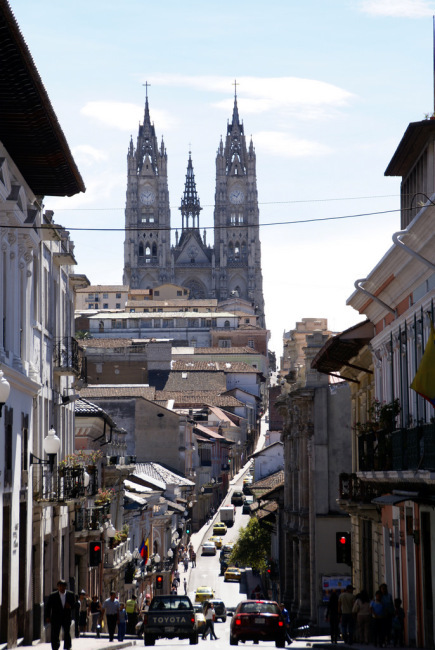 After the Ventanal, we went back to the Historical Center to the Ronda Street, to see the colonial streets from closer. The Historical Center and this street in particular have been restored and security has been increased to enable tourists spend some time enjoying the sights. 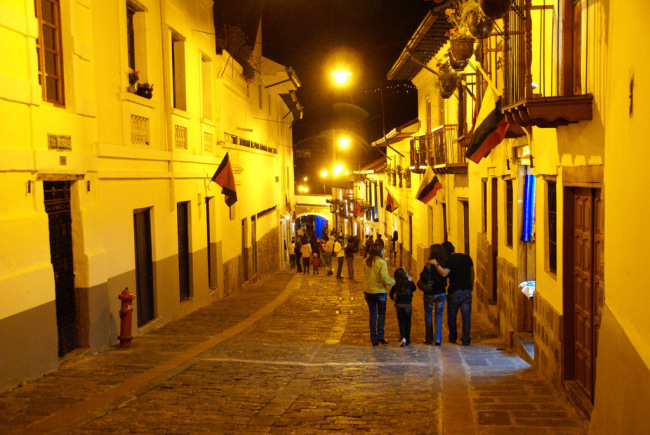 This cobbletone street is closed to cars at night and is inviting, well lit, and gives a true “old Quito” vibe, you really feel like you go back several centuries. 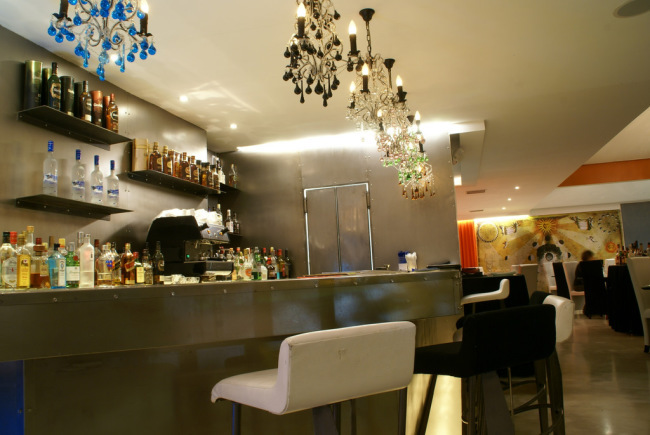 La Ronda is also full of traditional restaurants, very cheap compared to the ones in the North. For dinner we wanted to contrast the tasty street and typical food we had for breakfast and lunch with the more modern and international dining that Quito has to offer. 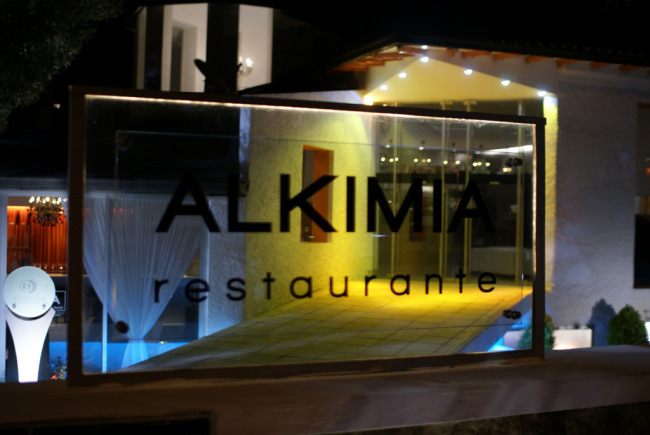 We decide to go to Alkimia, an upscale restaurant specializing in Mediterranean and Latin cuisine with a strong focus on local ingredients, located in La Floresta neighborhood. 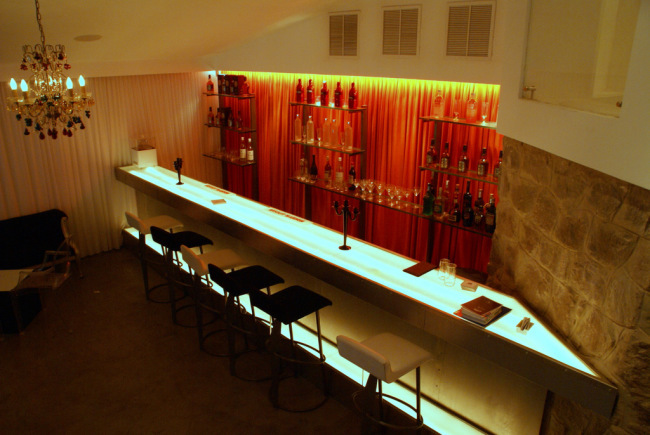 The setting is very modern, with just enough light, but not too much, lounge music and contemporary furniture. 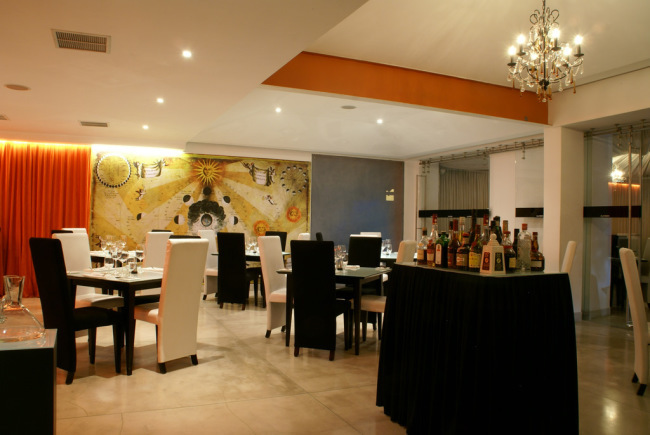 The restaurant has different areas, including a private room downstairs, a lounge bar, the main room and the pergola where we ate. 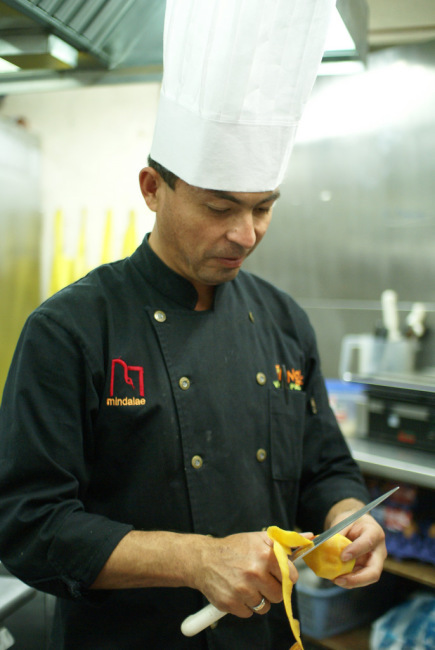 Julio, the chef, was our host and opened Alkimia doors to us. 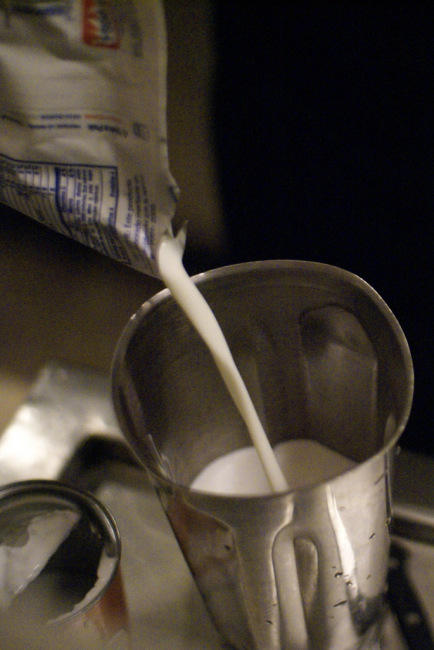 He was running late because he had a lot of work in his other restaurant, the well known Theatrum, so while we waited we met Patricia at the bar and asked her for batidos de coco or freshly made coconut milk shakes. We were kind of hoping she could make these since we had enjoyed them the previous week at the beach but did not expect this drink to be available in the highlands, but fortunately, she found some coconuts in the kitchen and made our dream drink reality, it was delicious and nicely presented with some white chocolate. 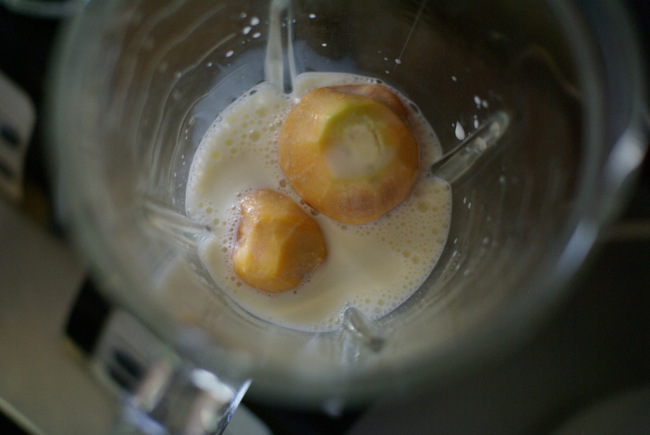 Place the coconut milk, condensed milk and milk in the blend, mix well. 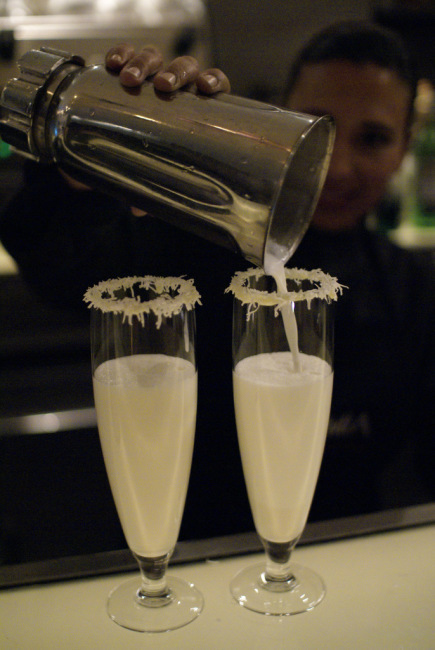 Add in the fresh coconut pieces, blend lightly and serve in a glass garnished with shredded coconut. 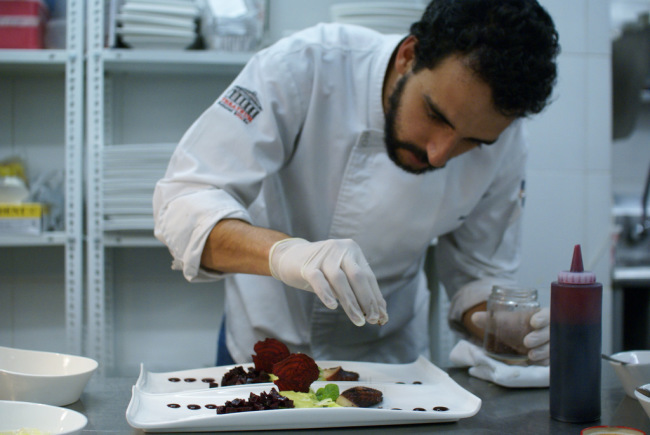 Once Julio arrived he tailored a tasting menu according to our preferences including three appetizers, two entrees and a degustation of desserts. He was amazing! 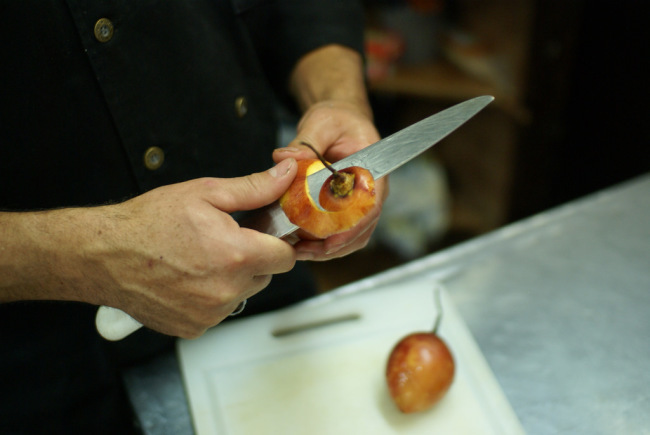 He invited us into his kitchen and allowed us to photograph the preparation of our first appetizer, so we were able to share a bit of his passion for perfection. It was not hard to make good pictures of the food he was serving us. 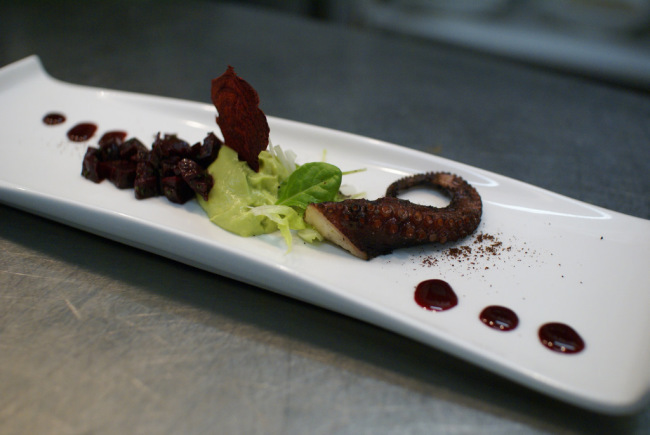 Our first appetizer was grilled octopus, avocado mousse and beet confit served with beet greens, beet reduction and zartar. 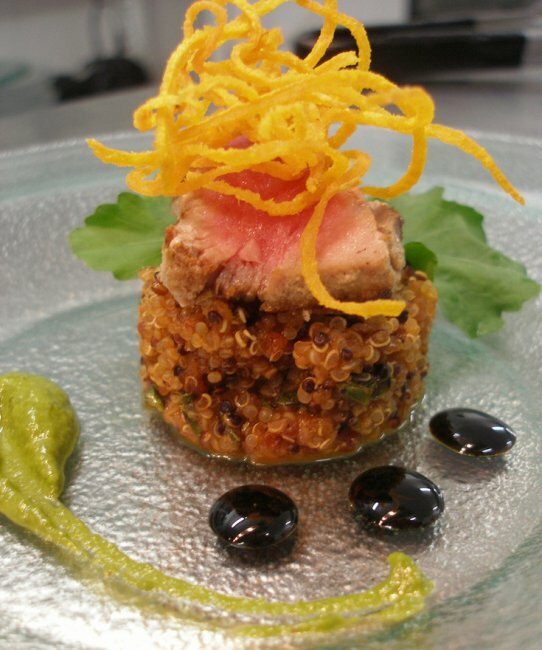 Next we had a perfectly grilled red tuna on top of a pilaf of red, black and white quinoa, arugula pesto, balsamic honey and lime vinaigrette. 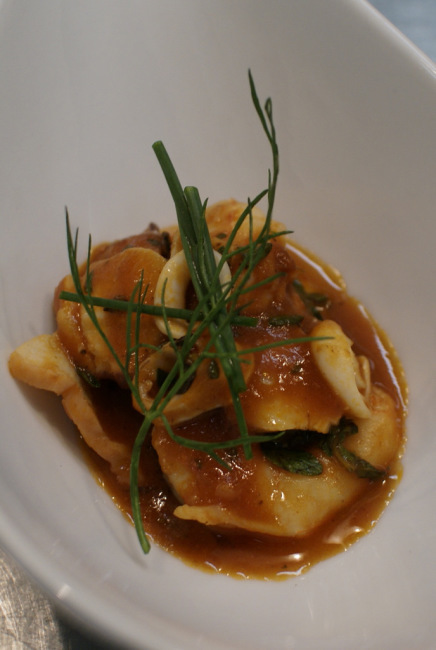 Our final appetizer was Spanish inspired seafood stew made with octopus, squid and shrimp in a saffron and panca (hot pepper) broth. 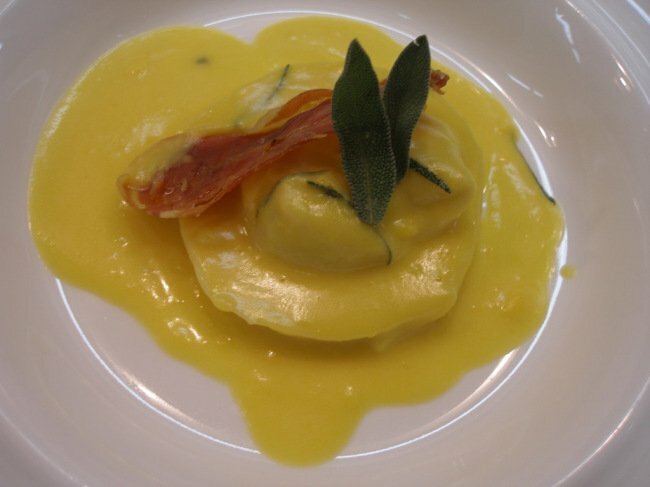 Our first entrée consisted of goat cheese and sage raviolis in a creamy squash puree. 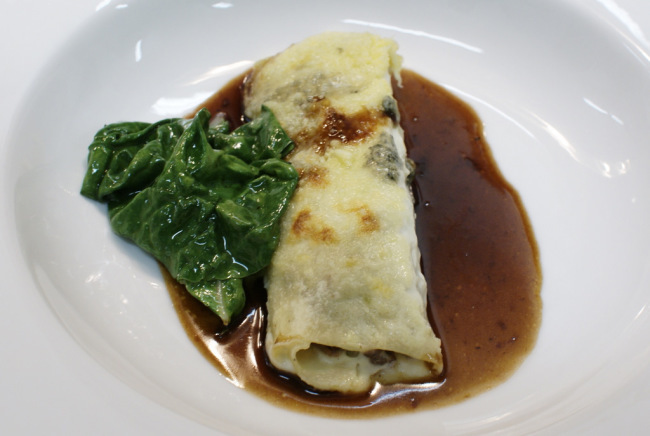 The second entrée was cannelloni stuffed with oxtails braised in red wine, sprinkled with blue cheese and broiled au gratin, served with chard and the oxtail braising jus. 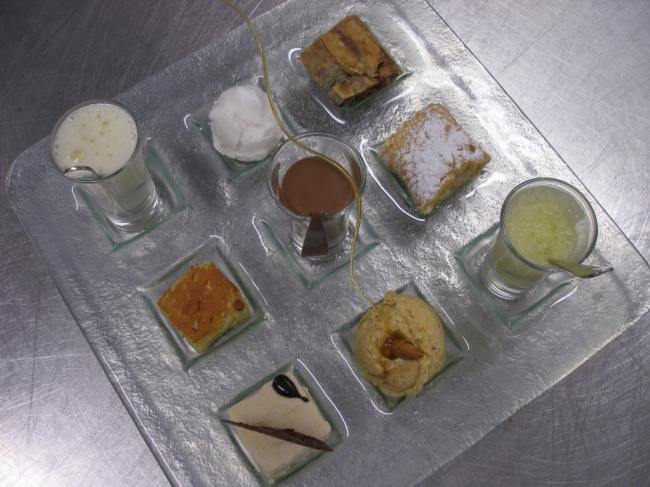 We finished this incredible meal with a degustation of yummy desserts (Olga’s favorite part). 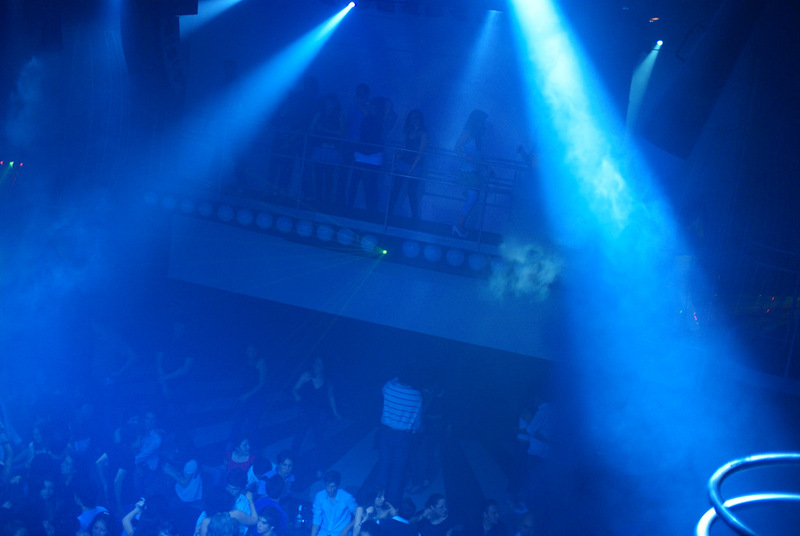 We went to Punto G, a cool dance club, to burn a few calories and enjoyed dancing Salsa, Reggaeton and Techno. 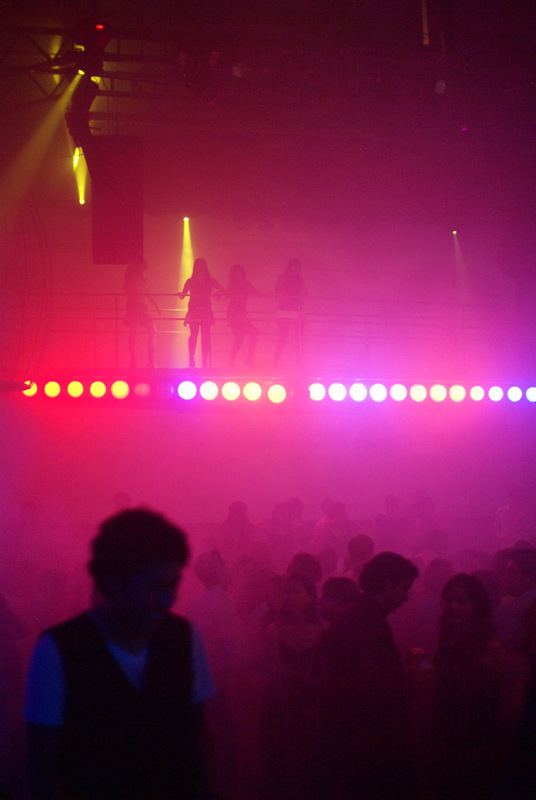 For Olga and I this is the best club in Quito for all the good moments we’ve spent there (Hola los primos!). 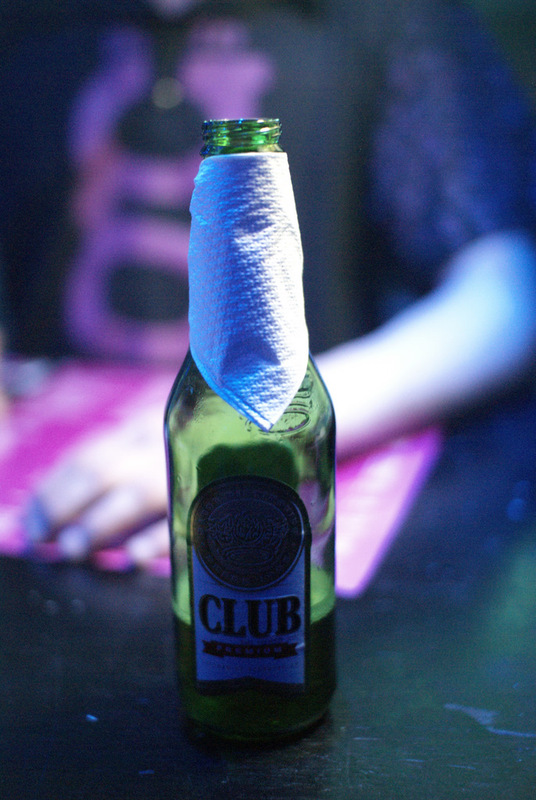 The club was pleasant as usual; we managed to find some space in our full stomachs for a Club Verde, a very tasty local beer. 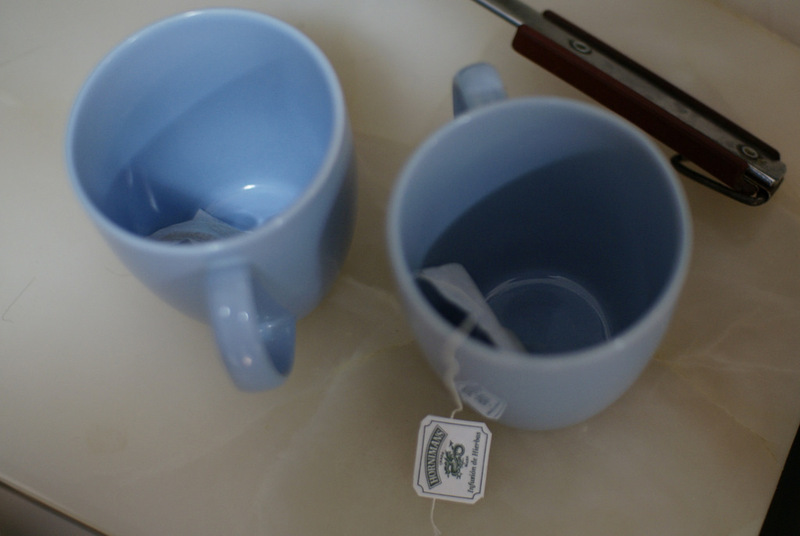 We danced a bit and got back home to have our last drink “an aguita de Cedron” or lemon verbena tea. 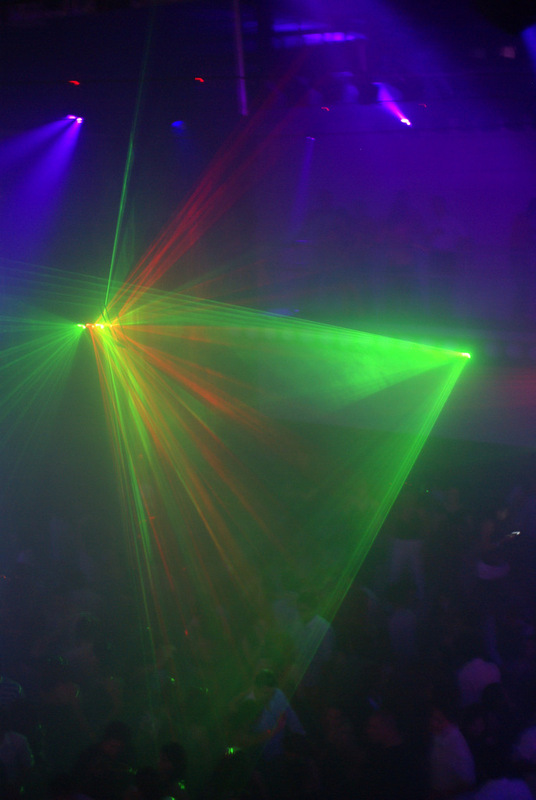 An interesting anecdote: I lost my SLR lens cap while dancing so I went to see the club manager and thanked him for his warm welcome, I told him something like “If you find a lens cap, please keep it for me”, he looked at me and said “I think I saw it”. 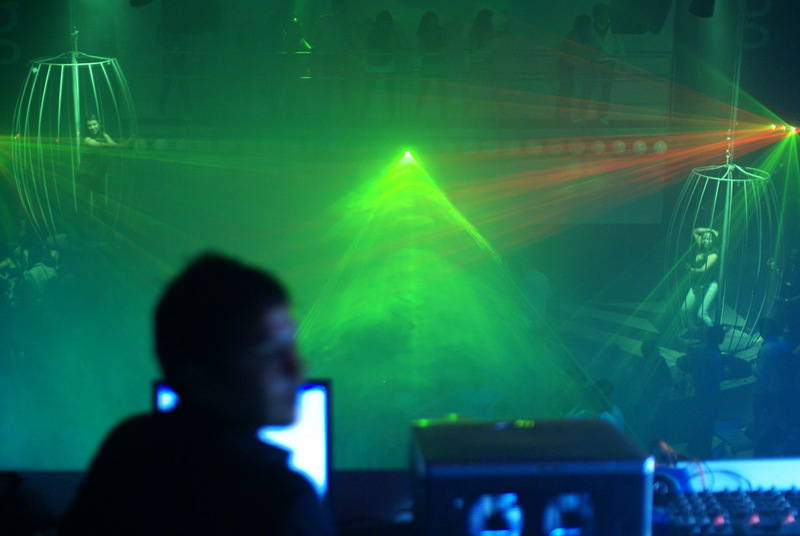 I followed him unsure it could be true and he took it from the dance floor! Amazing eyes he had (lens cap is black)! 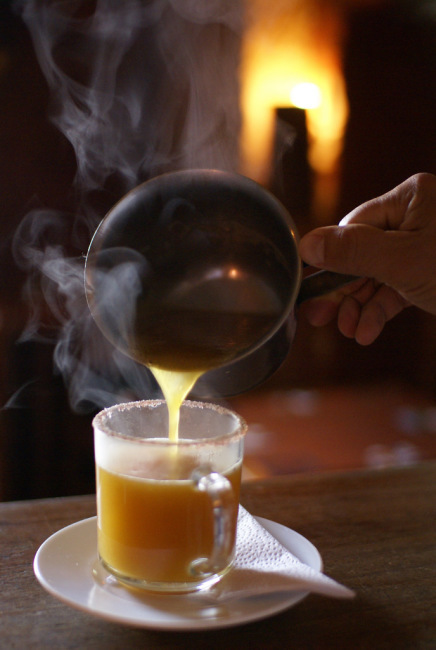 Special thank to all who helped us put together the wonderful culinary tour of Quito, including: Foodbuzz for this great opportunity. John at Tianguez, for his great service and hospitality. Katrin at Ventanal, for letting us come even if she had a big event with the Ecuadorian government. 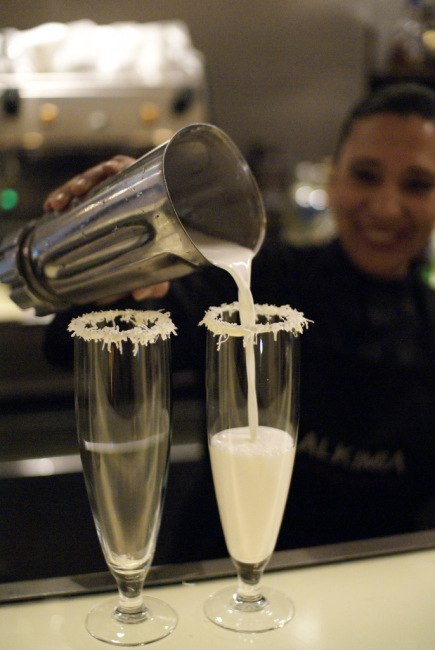 Patricia at Alkimia, for the best coco milkshake we’ve tasted so far in Quito, and for doing it with love and care. Julio at Alkimia, for all the time you gave us even though your daughter was not feeling well, for being such a cool guy, and for the great food of course. Cristian at Punto G, thanks for the lens cap and for always making us feel welcome. All the other waiters and waitress we won’t forget even if we do not know their names. This is end of Matt and Olga’s story; in the second part, Marc and Laylita share their story and photos. I’m really glad to come across this site. 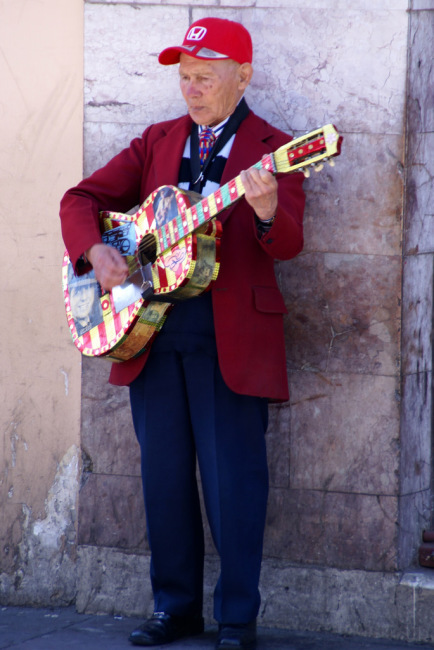 I’ve live in Quito for 30 years and I still learned a lot and enjoyed all the pictures. You asked where Rosalia Suarez is and I thought I’d better respond since their shop is directly in front of ours in Cumbaya. We are both up just half a block from Francisco de Orellana on calle Salinas. If you know where Pims is or El Chagal then you have found Salinas. 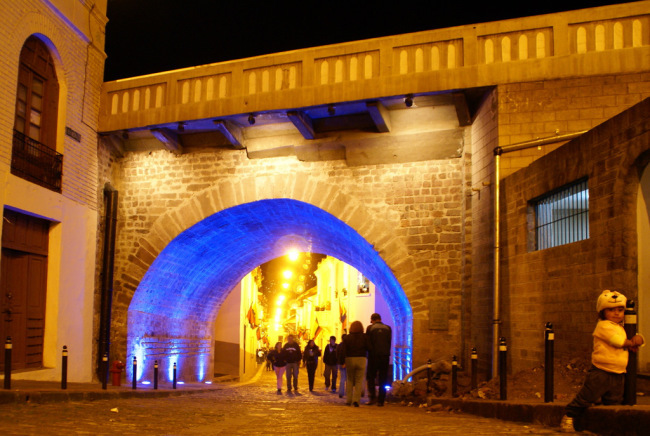 It’s also the same street where the famous Palacio de la Fritada is located. The family that runs Rosalia Suarez has been the same for over 100 years! 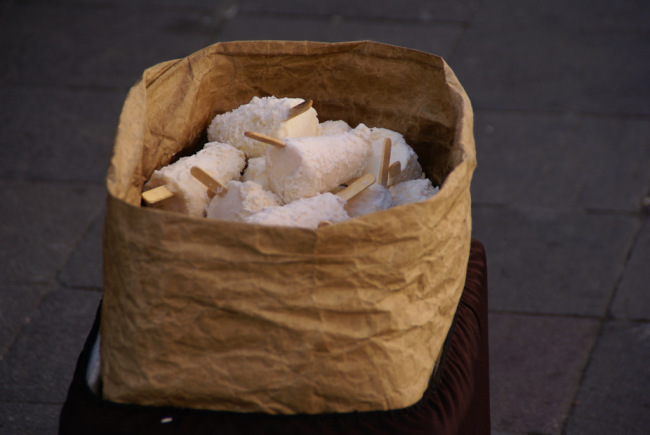 So the next time you are in Cumbaya please visit calle Salinas and enjoy sampling tasty treats from one of the oldest and one of the newest artisan food shops in town. Absolutely love this site. I was a missionary in Ecuador for two years, 18 months of it in Quito before going to Santo Domingo de los Colorados and Otavalo. From what I can tell you live in the US now. 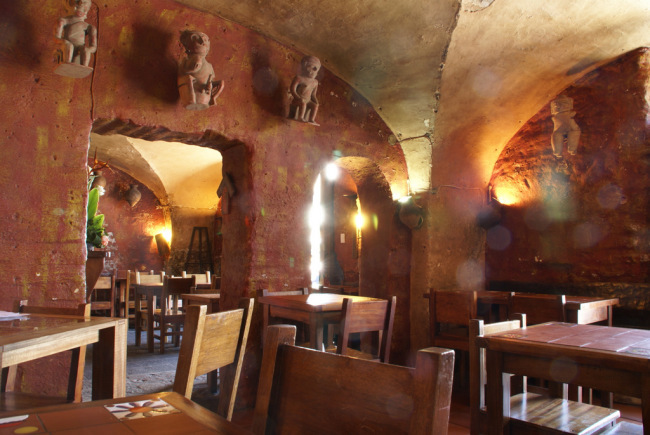 Have you been able to find tomate de arbol here? 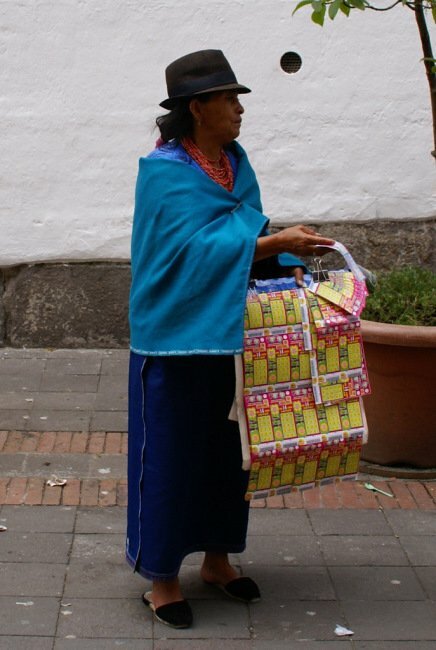 I’ve looked everywhere short of writing my Ecuadorian friends and asking them to send me some. 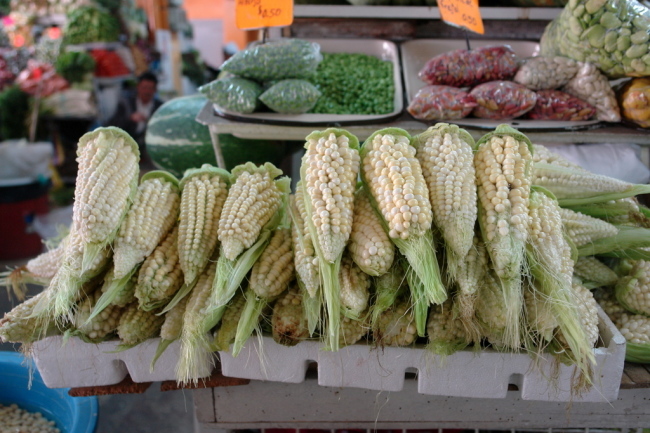 Hi Matthew – I’ve found them a few times fresh at grocery stores in the Seattle area, and also in Austin when I lived there – also someone from Oregon commented a while ago that they grow them and sell them at the farmer’s market in Bend, OR. I can find them more frequently frozen (whole) in some of the Latin grocery stores. When I lived in Austin I was able to start a plant with seeds from Ecuador, but it died during a frost while it was still small – so it would need to be protected from the colder weather. Matthew (and Laylita)…good news. Starting July 5th, 2018 the US will allow imports of Ecuadorian Tomate del Arbol. Yums-town!!!! During my most recent trip (this summer) my kids did have upset stomachs during the first week as they adjusted to the food (and altitude). 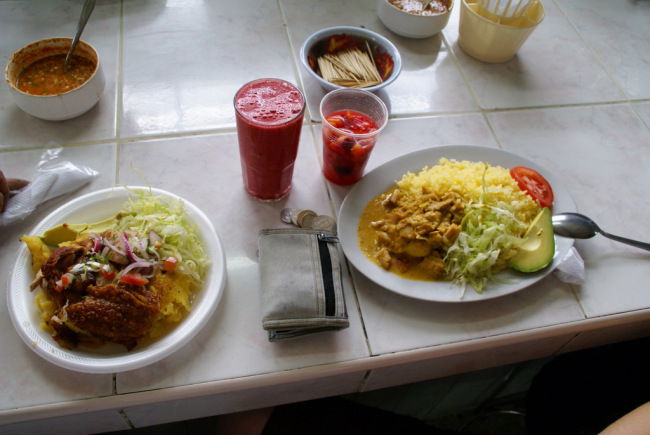 The street food, if fully cooked (empanadas, fritters) wasn’t so much to blame as the water (and the water is used to wash vegetables and fruits that are eaten raw). If they ate fully cooked food they were fine, but if they had a salad or fresh fruit at a restaurant they would get an upset stomach. 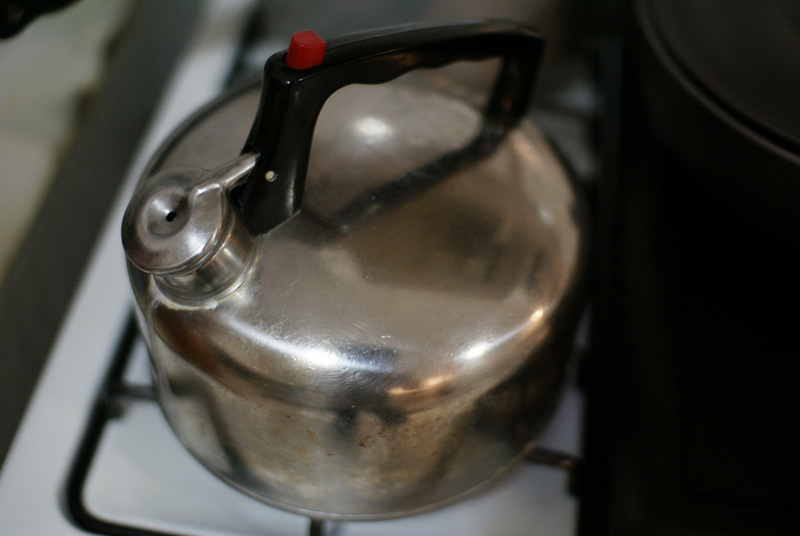 Drink bottled water, while the fruit juices are amazing, make sure to ask if they are using purified or boiled water. Shrimp ceviche is made with fully cooked shrimp so it’s very safe, but to be on the safe side you might want to try ceviche at one of the more upscale restaurants – also the best ceviches in Ecuador are found in the beach cities, but there are some decent places in Quito as well. 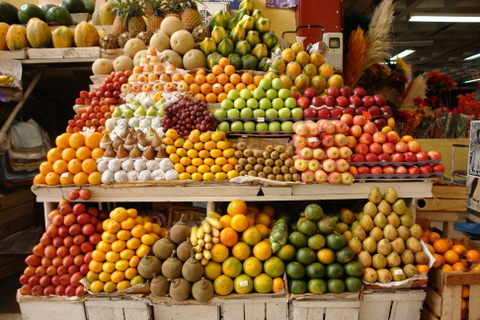 Hoo Quito mi lindo Quito , c’est magnifique, merci beacoup pour partager votre visit. 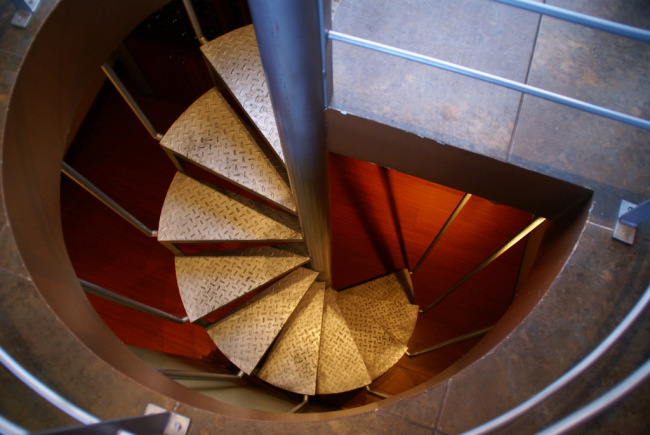 I just came across your blog and this post – fantastic! 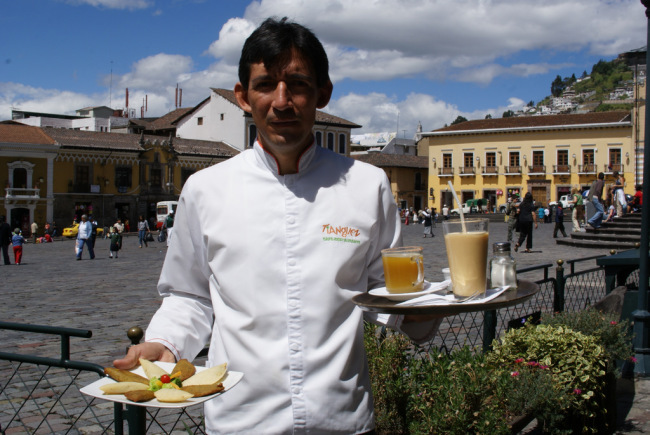 I lived in Quito in 2004 and Tianguez was one of my favorite places to go for Sunday breakfast right as the cathedral finished services. 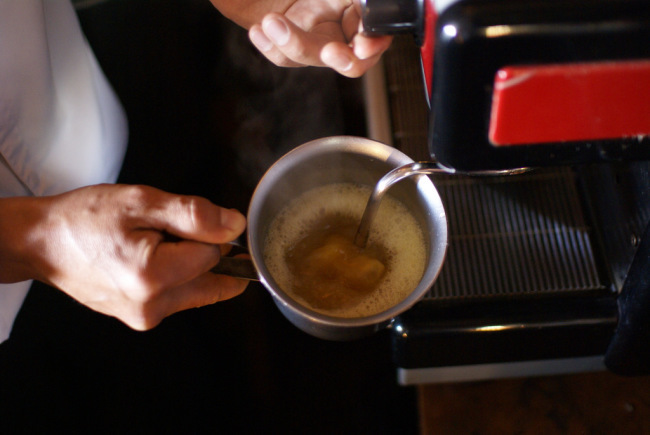 Hot coffee, good food, and people watching! I can’t wait to get back to Ecuador, it’s by far my favorite place on earth. Thanks so much for this post. 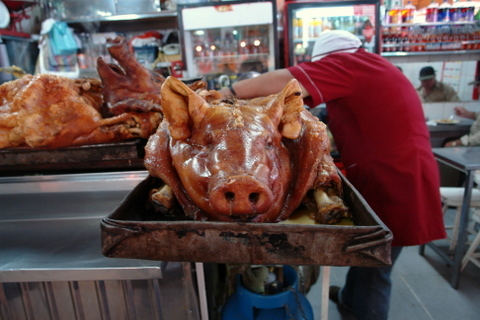 I’m also a travel food blogger and it’s been hard finding recommendations for Quito but I’ll be eating lunch today at the Santa Clara market! La felicito por su blogg , yo como ud , vivo en los EEUU . 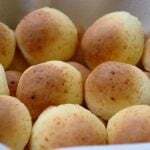 Las historias de su ninez que acompanan las recetas como tambien las nuevas experiencias con su familia dicen mucho de su persona , pero tambien es la historia de muchos de nosotros que vivimos fuera de nuestro hermoso Ecuador . 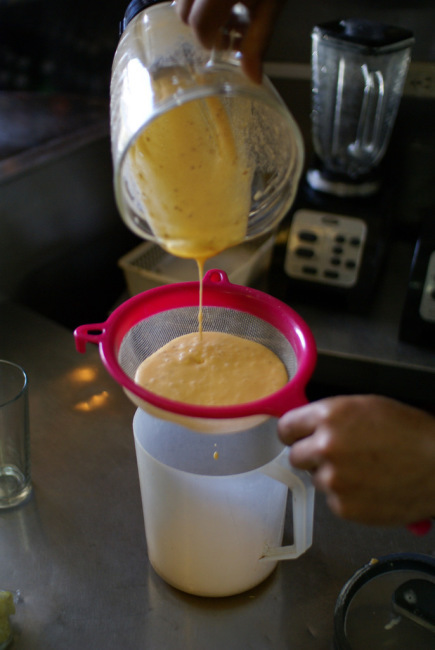 Le agradezco por ponerle tanto carino a sus recetas y fotografias , estas ultimas le dan vida y color a su blogg haciendolo mas facil de entender y abriendonos el apetito . 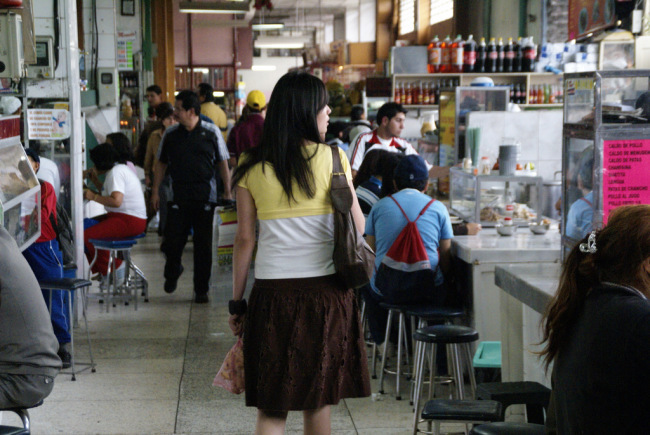 Yo estoy casada con un Ingles y estoy tratando de presentarle platos de comida ecuatoriana , es muy dificil , pero cuando le muestro las fotografias se la hace mas facil decidir si es algo que le gustaria comer o no . Muchas gracias a Matt y Olga por compartir sus experiencias , se ve que pasron muy lindo . 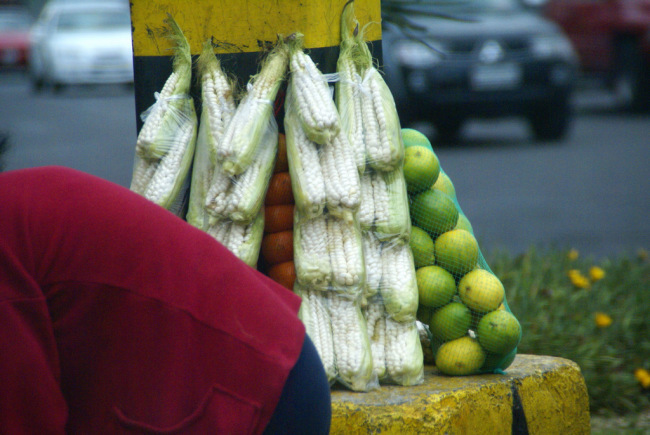 A mi me trajo muchos recuerdo de mis paseos por Quito . Gorgeous photos! I’ve never been to Quito but now I really want to go! 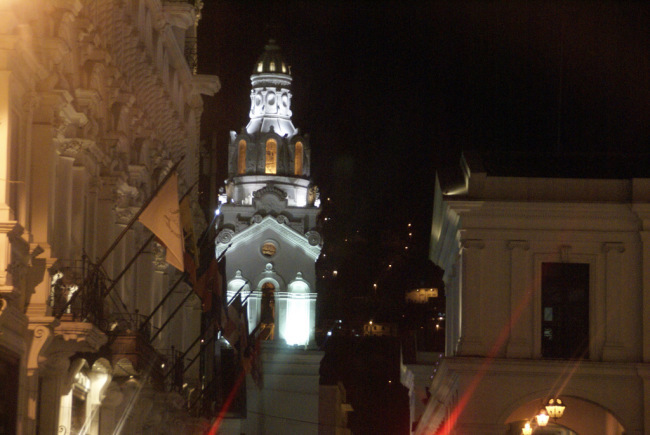 I spent 3 days in Guayaquil 2 years ago and I absolutely adored it. 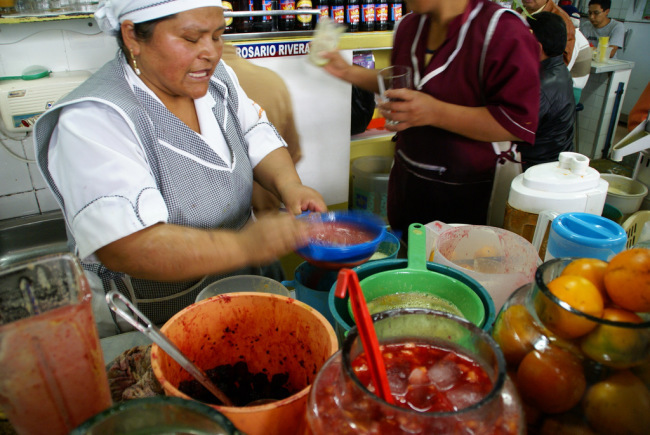 The people were so friendly and the ceviche…oh my god. I’ve been fantasizing about moving there just for the ceviche. Awesome post! 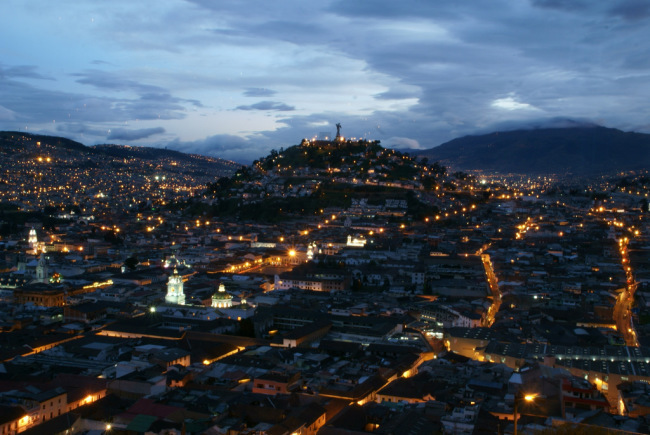 Reading this got me so excited about moving to Quito this winter to live with my girlfriend there! 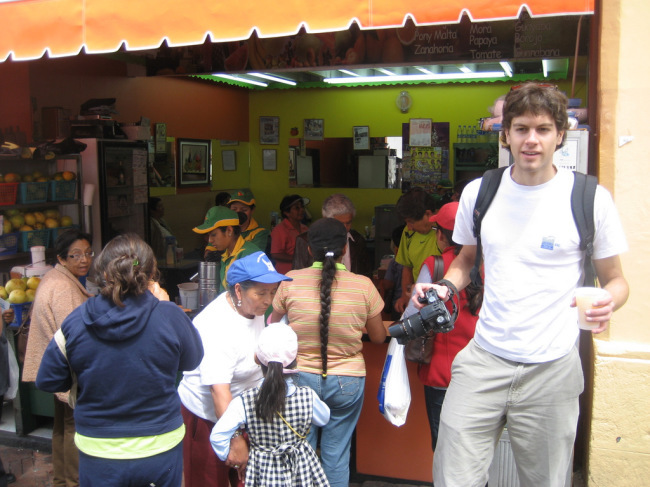 Do any Americans have any experience with staying in Quito longer than 6 months? You soooooooooooooo make me want to return to Ecaudor. This is a beautiful feast for the eyes. What a wonderful trip. Such beautiful places, people, and gorgeous food. Love this! Did I miss the part 2/team 2 post? I was looking forward to seeing someone travel with a small child since I’ll be going with my family (two small boys) to Cuenca later this year! What an amazing post! 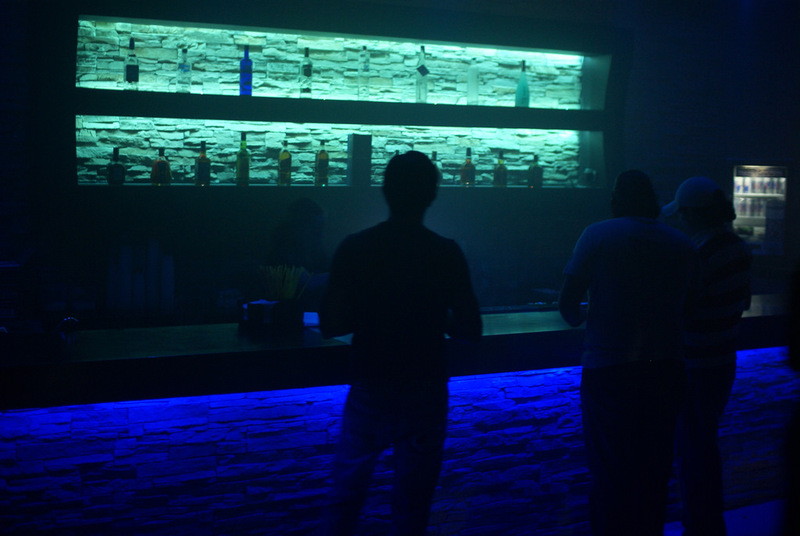 Your pictures of Quito are fantastic, particularly the one of the city at night and the club. 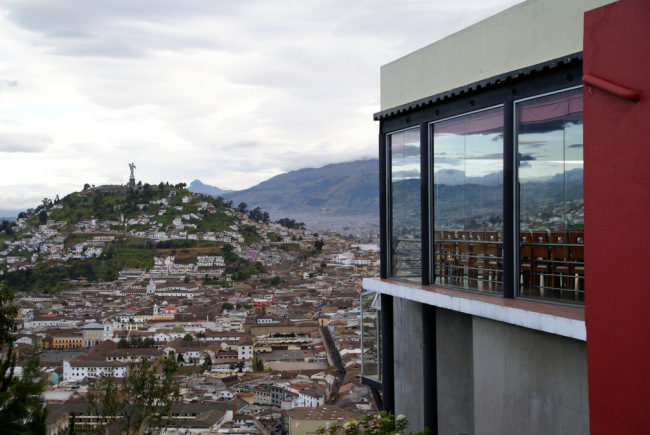 Really great post – the most enjoyable I’ve read in a while and was interesting as I visited Quito last year! Your blog design and photos are so beautiful! 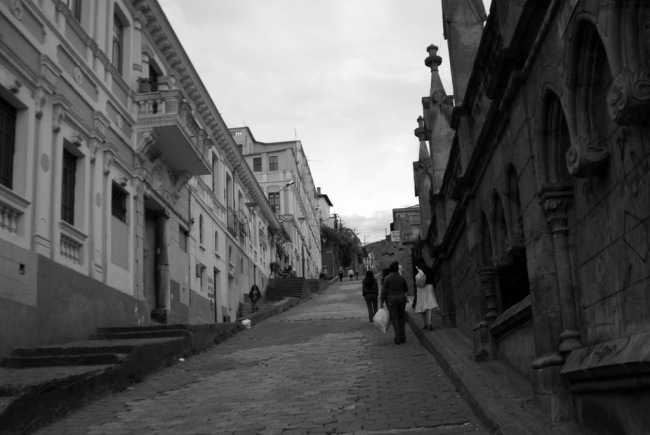 That picture of Quito is amazing, inspiring. I just discovered your blog and look forward to reading more. Wonderful post! 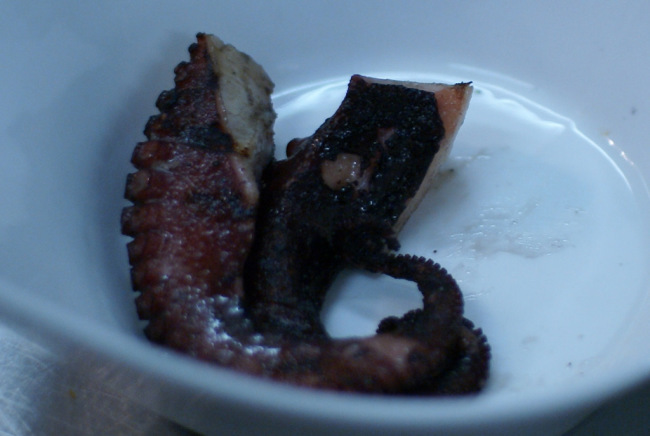 The food at Mercado Santa Clara looked so good! Maybe you should do something similar with other cities and provinces – Cuenca, Guayaquil, Loja, Tena, Manabi, Imbabura. 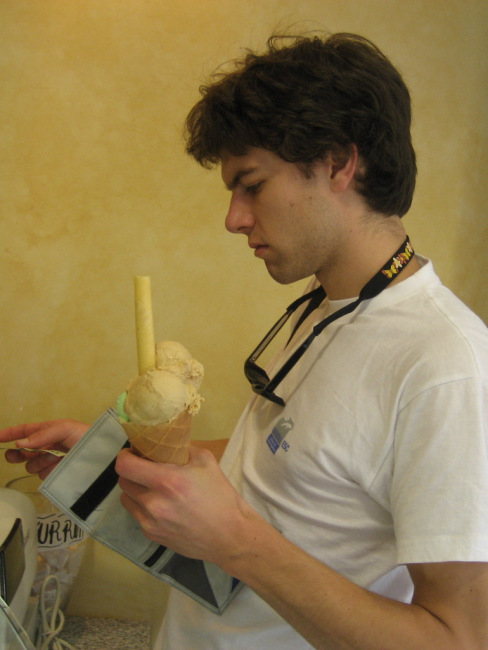 The helados de paila de Rosalia Suarez in Quito are the best – even better than the ones from Ibarra in my opinion. They are located on Avenida La Prensa – almost diagonal to the south of the main entrance to the Aereopuerto Mariscal Sucre. 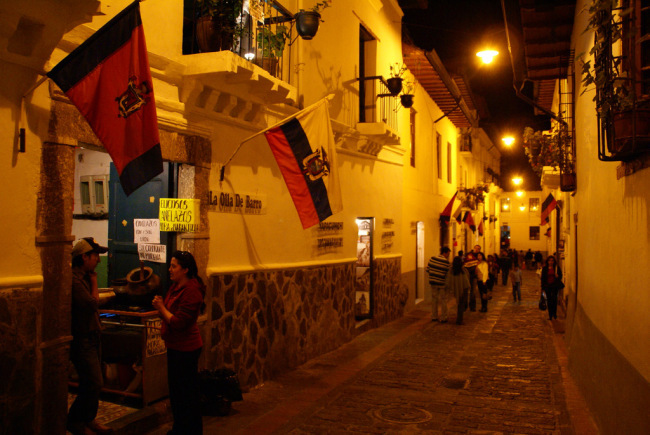 Okay, so Ecuador is on my list of places to visit! 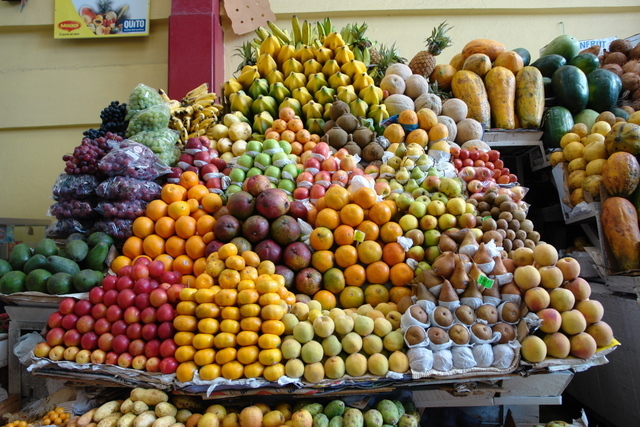 Excellent report, I always thought Quito the best place for the gastronomical tour, but can’t forget Cuenca either, so much Ecuador offers hasn’t been tapped, and thank goodness, more for us who know it’s treasures before they are spoiled by the many! What a wonderful post! 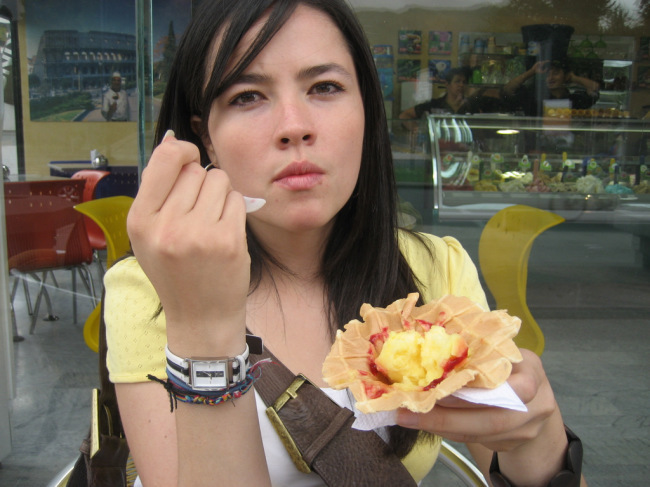 Now I want to visit Quito and taste all that wonderful food and visit all the wonderful sights. Thanks for your post. Great pictures! 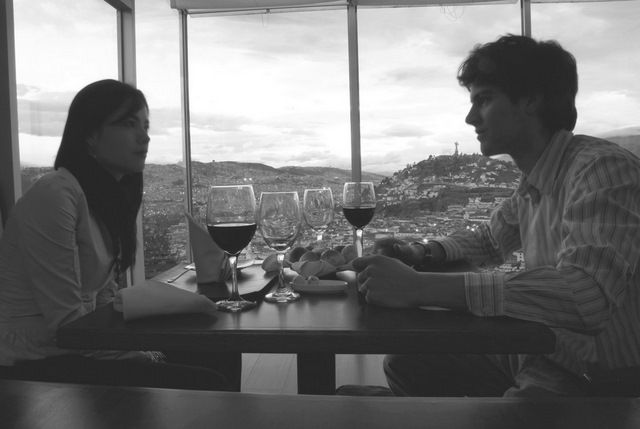 I love Quito, and I really miss there. I haven’t gone back there more than 15 years, and I always dream to go back there, and build the house near the Mitad del Mundo. Thank you for sharing your travel diary. Seems like a perfect day/night. The photos made me feel like I was the ‘third wheel’ along with Matt & Olga. And by the time ‘we’ got to Alkimia, I was really wishing I was with them. What a fabulous post! The photos and information are wonderful and you’ve taken a great deal of time to put this together from plan to execution and summaries. Thank you for all the work. It was well worth the time for all of us that are reading this. It’s like a “man on the street” travel guide. What an amazing post. Thank you so much for exposing us to this magical place. 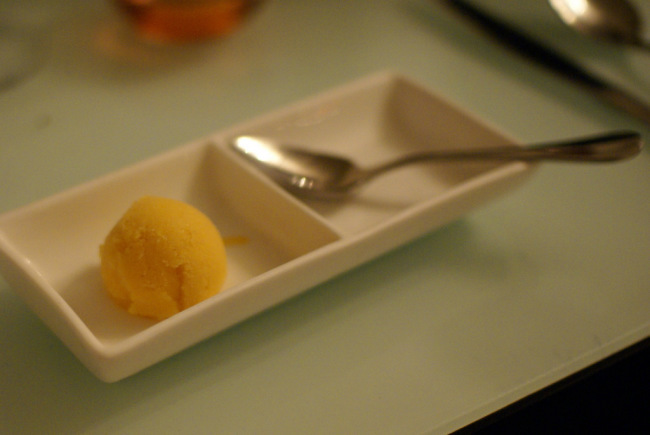 WOW this was an amazing post all around, and the food… the food looked amazing! 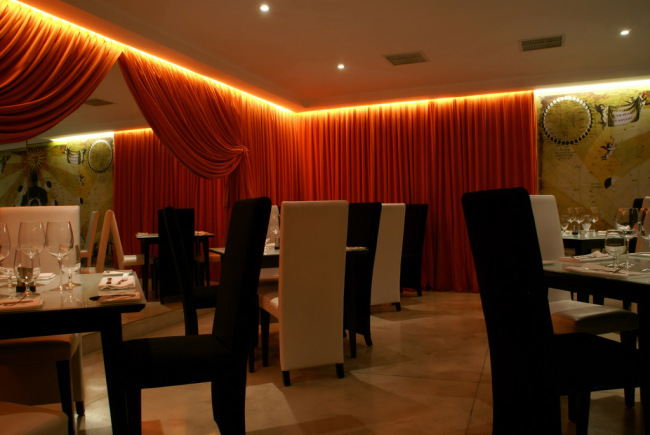 Just out of curiosity how much would a great dinner for 2 at the upscale/modern restaurant Alkimia cost? I have absolutely no sense of how far money would go down there. Oh how I miss that place and the amazing food. Thanks for showcasing it so more of the world can hopefully appreciate it! Wow. This might top all the 24 posts! 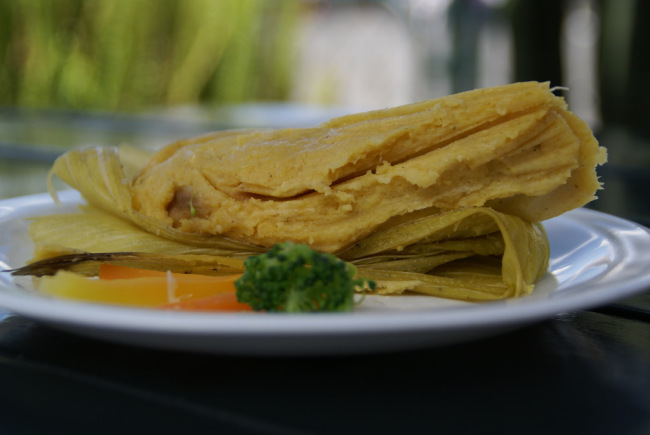 For some reason, the Santa Clara market lunch just looks so authentic and delicious. What an experience. I have already visited Quito, and loved it, but after reading your post I really wish I could go there again! Que genial! Me encanto mucho leer esto y las fotos estan increibles. I enjoyed this post so much! 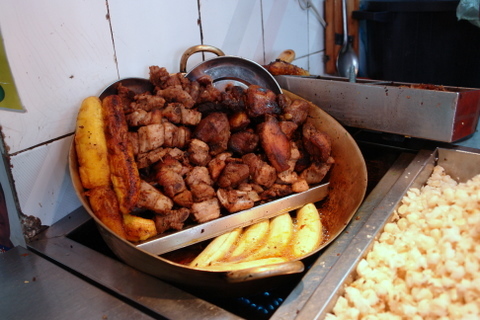 Learned a lot about Ecuador and its food culture for sure. Thank you for such an enlightening post. How awesome! 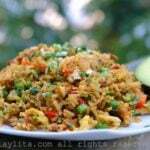 I haven’t been to Ecua since I was kid (almost 30 yrs) and this inspires me to go back w/my family!!! Thanks for the great story and food pics. And since I have kids, I can’t wait for part duex! 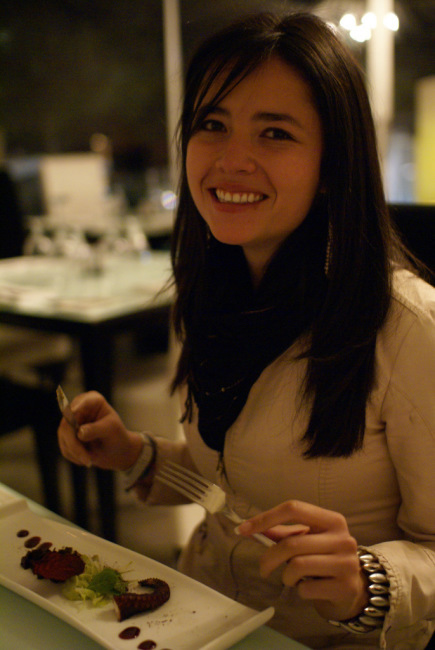 fantastic tour of food in Quito! 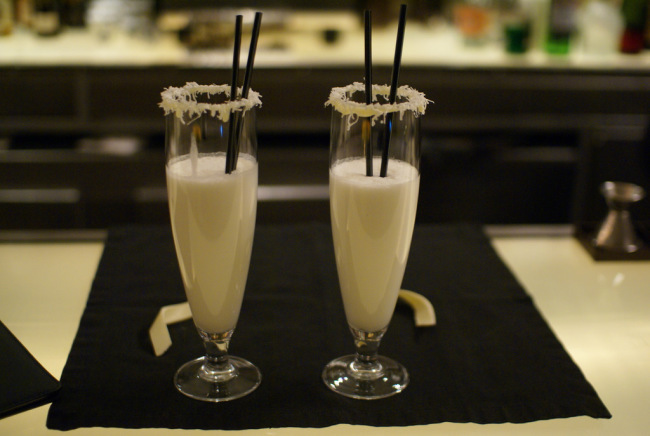 Love the coconut shake w/ the cocunut rim! This post is amazing! I’ve been itching to take a trip for some time now and your post hit on all the reasons why I love to travel. Thank you! I live in Seattle too. Any chance you’d be up for a blogger meet up? Drop me a line. Absolutely stunning pictures -thank you for sharing such treasures of insight and experiences.